Home • News • Do You Have A Mum In A Million? Do You Have A Mum In A Million? Mothers Day is on Sunday 31st March, and what better gift to give than a rose called ‘Mum in a Million’. 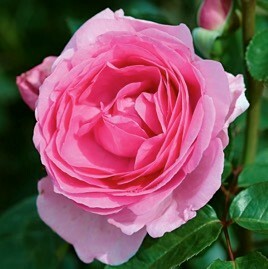 This beautiful rose has glossy foliage and an abundance of fragrant pink flowers that will bloom throughout the summer. It can be planted in a border or a pot, and will grow to approximately 1 meter in height. The Royal Horticultural Society (RHS) has given this rose its “Award Of Garden Merit”, which is their seal of approval that this plant is one of the best for your garden. ‘Mum in a Million’ is available at Squire’s Garden Centres from £9.99.